Benjamin and Anna love staying with their cousin Robin in his house near the forest. In the autumn, Robin takes them to see his favourite tree -- a giant oak that is 300 years old. 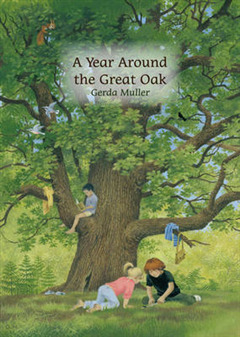 The children build a den under the oak tree's giant branches and watch the squirrels hide acorns in its wide trunk. In the winter they ski through the forest and meet the foresters who chose which trees will become firewood this year -- but not their beautiful oak tree! 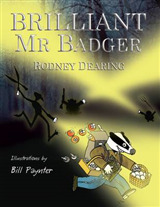 In the spring the children go searching for badgers and see many animals that live in the forest -- nesting birds, gentle deer and shy rabbits. One night, the tree helps Benjamin when he discovers a creature he didn't expect. How can the children say thank you? 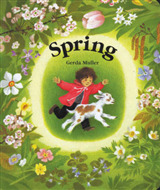 A beautifully detailed, seasonal story from Gerda Muller, who gave us the beloved Seasons board books and Where Do They Go When it Rains? Children will love to spot the realistic animals and birds that live in the great oak's forest.